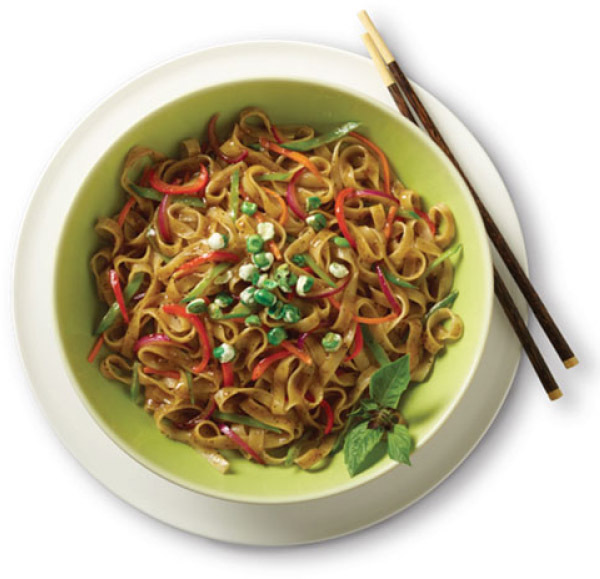 1.Place noodles in a large dish and cover with very hot water; let soak 10 minutes or until soft. 2.Drain noodles and toss with sesame seed oil. 3.Heat vegetable oil in large skillet. Add red pepper, red onion, snow peas and carrot; cook, stirring, over medium-high heat until tender. 4.Add garlic and continue cooking 1 minute. 5.Add noodles and Culinary Tours Lemongrass Tamarind Sauce, cook and stir until heated through. 6.Serve sprinkled with crushed Culinary Tours Wasabi Peas, if desired.